Press Release (ePRNews.com) - Pittsfield, Mass. - Apr 08, 2018 - From endearing portraits to dramatic landscapes, Fontaine’s Auction Gallery will present a two-session fine art auction on Saturday, April 21. A 100-lot discovery session will kick off the day at 10 am with uncataloged but quality estate-fresh fine art followed by a notable grouping of 200 cataloged artworks at 11:30 am. Absentee and Internet bidding is available on LiveAuctioneers, Invaluable, Auction Zip, Ebay Live and Fontaine’s Live. The main session will contain 200 fully catalogued lots featuring works by Norman P. Rockwell, John F. Carlson, Charles C. Curran, Paul E. Pissarro, John C. Terelak, Alexandre N. Averin, Minas Avetisian, Friedrich J. Voltz, Clementine R. Hunter and many more. Oil paintings, watercolors, gouache, etchings, sketches and mixed media works encompass a wide range of categories, including American and European portraiture of the 19th and 20th Centuries, American, British and Dutch landscape scenes, still life paintings, seascapes and harbor scenes, etchings by Louis Icart and Renoir, as well as impressionist, post-impressionist, folk and contemporary works. 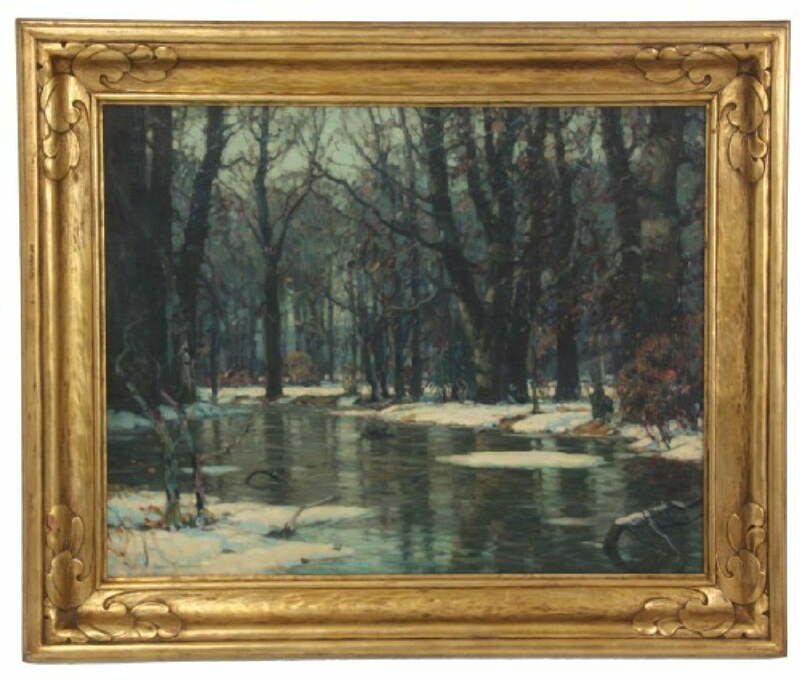 Among landscape standouts is a signed oil on canvas by John F. Carlson (1875-1945), “March Floods,” an impressionist forest landscape depicting a wooded scene with remnants of snow melting and flooding the forest floor, 33 by 40 ¼ inches framed. American art continues to figure prominently in the auction as evinced by a signed Charles Courtney Curran (1861-1942) oil on canvas from 1923 titled “Misty Afternoon.” The landscape scene shows a woman standing on the rocks of a mountaintop in Cragsmoor, N.Y., 27 ¼ by 31 ½ inches framed. Also on offer is signed oil on canvas by John Charles Terelak (b 1942) of a post-impressionistic landscape scene, “Sunset On The Marsh,” 35 by 43 inches framed. Always an auction favorite, Norman Rockwell (American, 1894-1978) is represented in this sale with three whimsical examples, all accompanied by a Christmas from the Rockwell family, starting off with a pencil on paper sketch, “Maid With Movie Magazine” (alternately titled “Cinderella” for The Saturday Evening Post (Nov. 4, 1922), 17 by 13 ½ inches. A mixed media with watercolor on paper by Rockwell is a portrait of a boy, 13 ½ by 11 ½ inches. A pencil on paper sketch, “Christmas: Santa Claus Reading Mail” (alternate titles are “Santa At His Desk” and “Letters To Santa”) for The Saturday Evening Post (December 1935). The scene depicts Santa Claus seated at a writing table with his pipe, holding a quill pen and a letter in his hands, on the table is his ledger, an inkwell and a stack of mail, 15 by 10 ¼ inches. The auction takes on an international flavor with several choice works from Asia and Europe, including a signed Yanzhou Xu (Chinese, b 1961) oil on canvas portrait of a Chinese mother holding her child, 49 by 39 inches; a Roelof Jansz van Vries (Dutch, 1631-1701) landscape of a homestead scene with figures, house and trees, 26 ¾ by 30 ¼ inches; and a signed Friedrich Johann Voltz (German, 1817-1886) oil on canvas of a lakeside landscape with cattle in the foreground, a man seated in a rowboat on the shore and a mountainous background, 24 by 37½ inches framed. Also crossing the block is a signed Franz Eduard Meyerheim (German, 1838-1880) oil on canvas, “Mother’s Joy,” 1871, of an interior scene of a woman walking down a hallway and holding her baby, coddled in a blanket, 28 ¼ by 25 1/2 inches. Fontaine’s Auction Gallery is at 1485 West Housatonic Street. For more information, https://fontainesauction.com or 413-448-8922. Original artworks take top lot honors at Bruneau & Co.’s November 25th auction in Cranston, R.I.